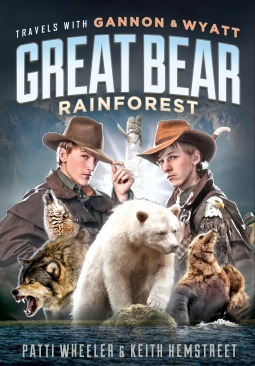 Twin brothers, Gannon and Wyatt, are invited to the Great Bear Rainforest in British Columbia, Canada, to search for the “spirit bear”, a rare albino bear said to be the Spirit of the Rainforest. But when their parents go missing, the brothers must trek into the wilderness alone to search for their parents and uncover a plot to destroy the delicate rainforest ecosystem. They face danger from the predators of the forest, wolves, black bears, and grizzlies, and it will take all their wilderness survival skills to make it out alive. I loved this second book in the series! There is even more action in this one, and the plot really keeps you in suspense! The writing is in a journal style, as the two brothers write about their experiences and adventures. I liked seeing how the brothers get annoyed with each other, but ultimately respect each other, and take care of one another with true brotherly love. They have some great character development through the story. The rainforest is so vividly described, and there are a lot of interesting facts about the area and anecdotes from the natives and explorers. There’s so much good information in this book, but it’s woven into the exciting story so that you don’t even realize you are learning! And I loved reading about the survival skills the twins learn, because the reader learns right along with them. I would recommend these books for readers aged 7-15, but anyone interested in travel, exploration, and adventure would enjoy reading them! Disclaimer: I received a copy of this book from the publisher/author in exchange for a free and honest review. All the opinions stated here are my own true thoughts, and are not influenced by anyone.